SANCHEZ: Why does it seem like the Republican Party is only going to the South, the Southern states, and the Democratic Party is starting to stay in the Northeast and then maybe branching out into some of the other areas, like Pennsylvania, where Arlen Specter is leaving? I mean, does that worry? 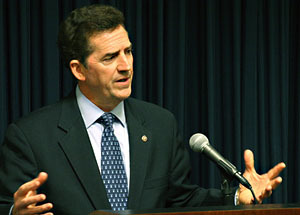 DEMINT: Well, it’s not just politically. People are moving from the northeast and from the northern part of the country to the south for a lot of reasons. And I think you see heavy unionization and forced unionization in Pennsylvania and Michigan, these other states. And obviously they’re very much for the Democrat big-government approach. But we see that falling apart with American auto companies. We see it falling apart all across the country. Come on. DeMint may not be doing himself any favors with this kind of head-in-the-sand stuff, and in any case it’s not really true that there’s any serious regional migration between north and south. Still, he didn’t say people were moving south because of unionization. He said people were doing it “for a lot of reasons” and then, responding to Sanchez’s question about why Dems were branching out into Pennsylvania, suggested that places like Pennsylvania and Michigan are friendly to the “Democrat big-government approach” because of their high unionization. And he believes in his heart of hearts that this is falling apart and conservatism will prevail. This is probably wrong too, but it’s not nearly as risible as the notion that factory workers are fleeing south to avoid closed shops. CNN’s own summary got it wrong. DeMint is a troglodyte, but this is fairly ordinary political blather, not the high-octane idiocy they made it out to be.